The Miao minority people traveled from their mountain home to perform the 'Hallelujah Chorus' with Consort Caritatis. This was their first contact with foreigners, other than the missionaries who had taught them Handel's 'Messiah'. For over one hundred years they had passed down this masterpiece of western civilization by oral tradition, until early in 1999, when they had attempted to write it down for the first time. Following the performance with the Canadian choir, the Miao people began singing, "Dear friends, it was so wonderful to meet you, and now we must say goodbye, but, one day we shall meet you again in heaven". Amidst tearful goodbyes, IFA's classical music director presented the Miao with two new scores of 'Messiah', which they joyfully received. They in turn presented Howard Dyck with a signed copy of their oral tradition version. Maio leader recieving new scores for 'Messiah'. The '99 Kunming International Festival of the Arts was IFA's third and most extensive cultural exchange to date. Titled "Ode to Joy", it drew almost three hundred artists, educators, and other participants from twenty countries and five continents. Over four hundred Chinese artists participated in this historic event. Kunming, the host city, has a population of over two million and is the political, economic, and cultural center of Yunnan Province. Yunnan is home to over forty million people, including more than half of China's 55 minority peoples. 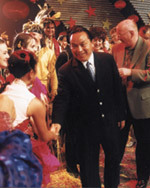 The International Arts Festival was an official part of Expo '99 and took place in partnership with the Yunnan Provincial Government, the Cultural Ministry, and the Communist Party. IFA also partnered with a China-based organization with a shared focus and methodology. Festival participants were overwhelmed at the tumultuous welcome they received upon arrival in China. They were greeted by government and cultural officials, television crews, journalists, and a variety of different minority peoples singing and dancing in full costume. Students of the prestigious Yunnan Arts Institute also honored and welcomed the international guests by hosting a special evening of minority cultural expressions.